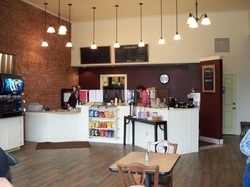 Open 7 days a week from 7am-7pm Baker Bistro specializes in fresh food fast. We have a wide selection of items on our menu ranging from Breakfast Burritos to giant Cinnamon Rolls in the morning & Rice Bowls, Fresh Salads, Deli Sandwiches/Paninis, Soups & Pastas in the afternoon/evenings. We also serve espresso drinks, fountain sodas & have a variety of bottled juices & sport drinks. Don't forget to finish of your meal with one of our yummy new desserts - a favorite is our decadent mint brownie or you can grab homemade apple crisp, cookies or rice crispy treats. The Bistro also offers beer and wine. You can buy it to drink with your meal or take a six pack to go. 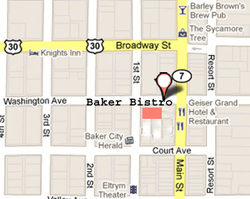 Driving Directions: Baker Bistro is located at 1925 Washington between 1st & Main in the historic Antlers Hotel. From I-84: Go west on Campbell. Turn left on Main Street. Turn right on Washington. From HWY 7: Continue on Dewey/Main. Turn left on Washington.